I've been missing for a while as my mother has been ill and was in hospital followed by a short stay in a nursing home. Thankfully she is now home again but very weak. So...this is "one I made earlier" in true Blue Peter style! It's actually one of the sample cards I made for Create and Craft when my window dies were released by Tonic Studios. This one is the Peony window used with the coordinating Clear Stamp Die Toppers which I've coloured with Promarkers. 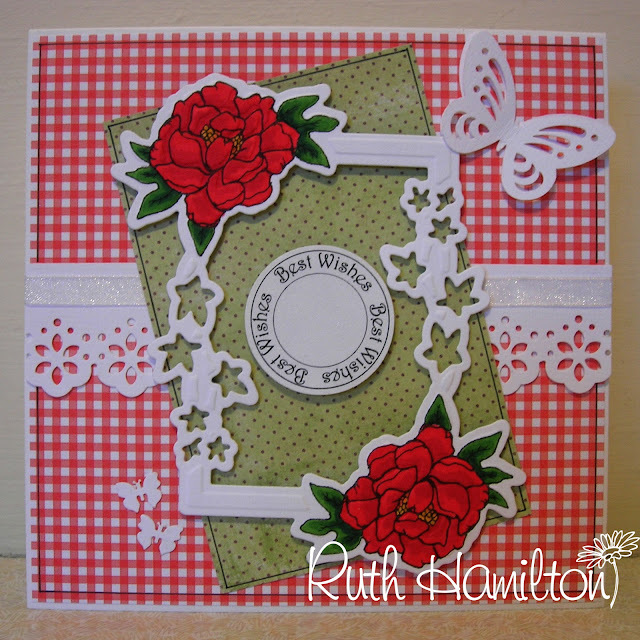 The border punch is the Daisy Border 2 and my favourite Multi Detail Butterfly is up there at the top if the card. I may be missing again for a short time as I'm going to hospital on Monday for an operation on my eye. I've been wanting this for a looong time and am really looking forward to the results!! I suppose it's only right that I should take a minute to warn you all.....I damaged my right eye badly a long time ago with the cardboard label on a sweater which I was trying on to buy. As I pulled off the sweater the label tore my cornea very badly and I have had terrible problems ever since. Don't say you weren't warned! !